Spring is a very important time of year for Ireland as the malaise of winter lifts, the sun decides it’ll start coming out (no matter how fleeting) and a little thing you may have heard of called St. Patrick’s Day occurs. As you may have guessed, the St. Patrick’s Day festivities are some of the most important in the Cork cultural calendar every year. The highlight of the celebrations each year is the traditional St. Patrick’s Day parade which takes place on a route throughout the city centre. There will be a number of public performances and celebrations, market stalls, and of course a pint or two served as the city celebrates the life and legacy of arguably the most famous of all the Patron Saints. If visiting, be respectful of local traditions and cultural differences, and if you are going to have a few drinks, then make sure to leave the car at your accommodation or make sure there is a designated driver as part of your party. April sees the Cork World Book Fest hit the town with a number of events centred around Cork City Library, the Grand Parade and Christchurch. A fixture on the cultural calendar since 2004, the World Book Fest grows with stature each year offering all manner of discussions, workshops and readings from acclaimed national and international authors working with all manner of genre. For the visiting Francophiles, Cork hosts a French Film Festival every March. Running for over 25 years, the festival highlights all manner of stunning contemporary and classic French cinema and is part of a wider effort to strengthen and celebrate the relationship between Cork and France. The Cork French Film festival schedule is a mix of screenings, discussions, Q&As and parties, all with a distinctly unique combo of Irish and French tastes. As you will probably be aware, Ireland has a rich history of poetry and writing and is not afraid to show its pride at some of its past heroes of pen and prose. Cork honours Ireland’s rich poetry history with the Cork International Poetry Festival every February. Comprised of a series of readings, performances, book launches and discussions, the Cork International Poetry Festival welcomes scores of contemporary poets from all over the globe, performing in a number of free and ticketed events that take place all over Cork. If you are in Cork during June then you are in for a treat, as the Midsummer Festival runs for two weeks of the month. One of Ireland’s biggest and leading cultural and arts programmes and over the last 15 years has welcomed a plethora of established artists from the worlds of dance, theatre, visual and street arts and many more. The Midsummer Festival is integral to Cork’s art scene and helps promote collaborations and relationships between Cork and the various international art scenes out there. The festival runs all across Cork and chances are you may see your fair share of art happening around you! To get the best our of a summer visit to Cork then check the Easirent in Cork car rental prices. 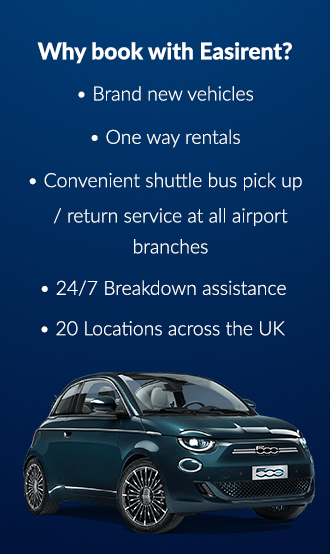 Our branch is located very close to the airport, we even offer a free pick up and return shuttle service! There’s also Live at the Marquee; a series of large scale concerts held at the showgrounds in the Cork Marina area of town. Running from June to July, all manner of major international stars grace Cork with their presence during the festival as everyone from Cliff Richard and Elton John to Kanye West and the Prodigy have played the city festival over the years. If you’re in town, and most importantly if you can somehow grab a ticket, then make sure you don’t miss out! The festival grounds are a 15-minute drive from the centre of Cork, but bear traffic in mind before and after gigs. Cork boasts the second largest natural harbour in the world, and to celebrate this the city puts on the Cork Harbour Festival around the time of the June bank holiday. Celebrating the Rebel City’s rich and storied nautical past, the Harbour Festival puts on a range of events both on land and on the water, with the biggest event being Ocean to City – An Rás Mór, a huge race that draws in participants and spectators from all over the world, competing in everything from traditional rowboats and kayaks, to dragon boats! The Ocean to City race is one of the biggest in all of Ireland, make sure to get there early for a prime viewing spot. The festival takes place across 15 locations in Cork, with Cork Harbour being a 30-minute drive from the heart of the city. If you’re a jazz fan, there’s a good chance you’re already aware of the Cork Jazz Festival. Sponsored by Guinness, the festival has been running for almost 40 years and has seen luminaries from the jazz world such as Herbie Hancock, Ella Fitzgerald and Gregory Porter grace the bill, as well as non-jazz acts such as Damon Albarn, Gary Numan and the Boomtown Rats. The festival takes place all-over the city in a range of free and paid-for events, with the majority of the big hitters playing the Metropole Hotel and the Opera House. The Jazz Festival brings over 40,000 visitors to Cork every October. If jazz isn’t quite your cup of tea, then early October also sees the Cork International Folk Festival take place. Similar to the jazz festival, the International Folk Festival has also been running for just shy of 40 years, and in 2017 saw folk legend Donovan and Irish folk mainstay Andy Irvine as two of the festival’s main headliners. The Cork International Folk Festival takes place at venues all across Cork, in a mixture of free and paid-for gigs. Music aside, the wider culture and DNA of Cork is celebrated during the appropriately named Culture Night, which occurs on the third Friday of September. Hundreds of free events take place until late on Culture Night, with a range of talks, tours, workshops and performances for all the family. These events take place all over the city, so bear traffic in mind, but when you’re in the thick of the fun, just go with the flow and immerse yourself into Cork’s wonderful culture scene. If you’re after a Halloween experience with a difference then seek audience with the Dragon of Shandon, a Samhain festival with a difference. A massive community project, the Dragon of Shandon is a celebration of life and death that traipses through Cork’s North-side and attracts thousands of revellers to take part and witness the spooky spectacular! As the year draws to an end and the nights draw in, there is nothing better than a nice trip to the cinema to laugh, cry, and maybe have a cosy little snooze, a perfect time you’ll agree for the Cork Film Festival, which runs in November. Ireland’s oldest annual celebration of cinema, the Cork Film Festival has been running for over 60 years and attracts a host of visitors from all over Ireland and beyond. Showing a range of movies from new releases to old classics and everything in between, the Cork Film Festival is bound to have something on show for everyone, with the majority of showings taking place in the Gate Cinema, the Everyman Theatre, and Triskel Christchurch, all within a 5-minute or so drive of the city centre. And finally at the climax of the year, take part in Cork’s Christmas festivities, including the GLOW spectacular at the weekends in the run up to the 25th. There’s everything from ferris wheels to mulled wine, street theatre to traditional carollers and all manner of Christmassey goings on for all the family. Aside from GLOW there are a number of markets, stalls, pop-ups and fairs all over Cork so wrap up warm, fill the car with snacks and fuel, and get out there and explore. And if all else fails, grab a newspaper, find a quiet spot in an old warm pub, and let the world stroll by. Lovely.